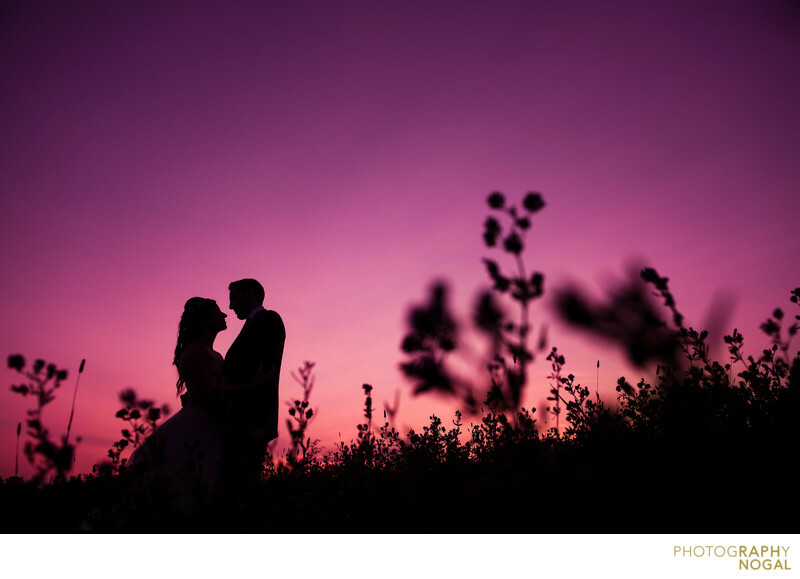 Taken on the Fields on West Lake in Bloomfield, Ontario, the bride and groom are shown silhouetted against a rich, saturated sky. I took the already beautiful outdoor scenery and decided to take a step further artistically. Wedding photos are so rarely vibrant, so this was a chance to create something truly bold, striking, and memorable. Silhouettes can be an excellent addition to wedding day photos as they are a bit more mysterious and add a sense of artistic flare. This photo was taken with a Nikon D750 DSLR at ISO 200, f3.5 aperture, 1/2000th shutter speed with a Nikon Nikkor 24-70mm f2.8 zoom lens, at 24mm focal length. Location: 15786 Loyalist Pkwy, Bloomfield, ON K0K 1G0.